2018: The Search for Atlantis – A History of Plato's Ideal State. A certain part of a scholar's life is dedicated to "ghost busting", i.e. to debunk wrong concepts existing out there, in the coarse reality of popular books, colourful magazines, and the vastness of the internet, and to provide the basis for a better understanding of reality at an academic level to all who are interested. This had been the basic idea of this book, possibly. And who would not support such a noble purpose? But you can exaggerate everything by going to the other extreme. This book is deeply disappointing. After Vidal-Naquet's one-sided book from 2005, written against all sorts of Atlantis supporters without exception, there was a chance to provide a more balanced view to the interested public, and to include new arguments. But the opportunity has been missed again. And like Vidal-Naquet's work, this book is not fair to its readers: The readers are manipulated by all sorts of unacceptable omissions, oversimplistic arguments, and misleading wordings, as will be demonstrated in the following. Furthermore, the book contains many mistakes. The manipulation starts right on page 1 in the very first line. There, the Atlantis story is addressed as a "myth" without further ado. But if one thing is sure, then that Atlantis is not a myth. Because Atlantis is presented in Plato's dialogues as a true story, not as a myth. Even if it is an invention, it is still not a myth. Atlantis is presented as the opposite of a myth. The story allegedly came from Egypt where it had been preserved in written form over a very long time thanks to the continuity of the Egyptian civilization. The claim of Plato's dialogues is, that Egyptian texts provide a window into the past, bridging the time of which the Greeks only know myths, or nothing at all. And it is true: Egyptian texts do indeed tell such stories of ancient times, and still today Egyptologists are able to tell a lot about other countries and peoples of which information has been preserved in ancient Egyptian texts. But this book stubbornly ignores this reasonable claim which deserves to be taken seriously and discussed. This book just goes on right from page 1 to press for the idea that the Atlantis story is a myth, time and again throughout the whole book. Time and again the question is raised why there is no connection between traditional Greek mythology and the Atlantis "myth". A question for which there is no legitimate reason to be asked. And right on page 1, the Atlantis story is called a "tale". The word "tale" is explicitly presented as the translation of the Greek "logos" without further ado. But this is plainly wrong. The word "logos" has to be translated with a neutral word such as "story" or "narration", here, whereas the word "tale" has a clear inclination towards a fabulous and imaginative meaning. Surprisingly, the book itself reveals the correct translation of "logos" with neutral words such as "account" or "story", but only in footnote 38 on page 361. Why hiding away the correct translation, while at the same time penetratingly talking of the "Atlantis tale" throughout the whole book? The myth ... the tale ... the myth ... the tale ... – it is really annoying, how this book tries to hammer down its message into the brains of its readers. The book really seems to be written to "program" the readers: Time and again, chapters begin with a special section in which some mythical and fabulous context is presented, or any kind of chaos and confusion is produced concerning the allegedly correct understanding of myth and truth. By putting Atlantis time and again in such contexts – in which it does not belong – the reader is step by step led to develop a biased perspective on the subject. You feel like brainwashed after a while. Atlantis is no myth and cannot be put into the context of myths. Atlantis is no vague memory but presented as factual story from a written historical tradition with clear details, and anchored in known reality (Sais, Pillars of Hercules, geology of Athens). In antiquity, there was even no discussion about the location of Atlantis, because the (alleged) location of Atlantis is clearly defined, too. Atlantis is no "paradise", and no "wondrous" island, as the book repeats time and again. There are no magical "wonders" in Atlantis, and in the works of Herodotus you find bigger buildings, larger armies, similarly fertile land, and older countries; and Herodotus was a serious writer, not a myth-maker. Some of the presented fabulous lands and towns are not fabulous but real. Only some of their features are fabulous, or distorted. This could well be the case with Atlantis, too, but why does this book not discuss this? Some of the allegedly "mythical" aspects of the Atlantis story are clearly not meant to be mythical by Plato, because Plato himself believed them. These are things such as a cyclical model of history, an age of Egypt of 10000 years and more, periodic natural disasters (mentioned only in footnote 43 on page 362), that good climate generates best people at the same place time and again (mentioned only in footnote 74 on page 368), or that there is no quarrel among gods. It is a major failure of this book to omit a serious discussion of historical-critical approaches. The word "historical-critical" does not appear once in the whole book. Historical-critical approaches such as Zangger's hypothesis concerning Troy, or the hypotheses concerning the Minoan civilization, are rejected in this book by the simplistic opinion that they do not fit to Plato's description, and that any change of Plato's description would be arbitrary. To express this opinion, the book puts forward the oft-cited word of Sprague de Camp about changing King Arthur into Queen Cleopatra (page 294). This oft-cited word misses the point completely. Only on one single page, it is page 34, this book admits the necessity of a historical-critical reading: In connection with Herodotus' works, there is talk of "the dangers of the literal interpretation of ancient evidence, especially when it comes to the dimensions of things." Very true indeed. But why then does this book puts forward time and again with explicit or silent agreement simplistic opinions such as the opinion of Christos Doumas, that Atlantis cannot be situated in the Mediterranean Sea because the Pillars of Hercules are obviously placed at Gibraltar (footnote 80 on page 368 f.)? This is exactly the simple-minded literal interpretation, of which this book correctly warned on page 34. Surprisingly, this book does not mention the important Sea Peoples hypothesis of Wilhelm von Christ from 1886, although it is a key component of most of the historical-critical approaches. The reader wonders: Why that? Furthermore, important academic scholars who were at least open to discuss Atlantis as a real place are not mentioned, among them Theodor Gomperz, Wilhelm Brandenstein, Massimo Pallottino, Rhys Carpenter, Sir Desmond Lee, and Herwig Görgemanns. This book even does not sort the historical-critical approaches together in one chapter. Zangger's hypothesis is put together with crazy horses such as Hanns Hörbiger, Immanuel Velikovsky, and Erich von Däniken, next to whom Zangger is placed. This is clearly meant as a message. This book does not shy away to ridicule academic dissenters in order to hammer down its one-sided message into the brains of its readers. Also very telling is the fact, that despite amassing all sorts of mythical and fabulous and incredible tales, this book carefully avoids mentioning that Herodotus believed that Egypt is 11000 years old, and even older. And only hidden away in a footnote the information is given that even Plato himself mentions an age of Egypt of more than 10000 years in the dialogue "The Laws" (footnote 67 on page 366 f.). – And in this footnote, this is mentioned only in order to (ab-)use it for the suggestion that the variations of numbers (9000, 8000, 10000, ...) allegedly mean that Plato himself did not take his numbers seriously. Scholars discussing Plato's cyclical view of history would throw up their hands in horror when confronted with this opinion! So, the Greeks in general had a wrong view of history and chronology and believed that Egypt is older than 10000 years, and Plato's Atlantis with its age of 9000 years blends perfectly into this picture. Which means that the 9000 years of Atlantis sounded reasonable in Plato's time, and that there is no reason to see an invention, but rather a common mistake of the time. – Yet instead of starting a reasonable historical-critical discussion, this book just presses for the simplistic view that with an age of 9000 years Atlantis would have existed in Stone Age (e.g. page 333, or footnote 69 on page 367 f.), and no further discussion is considered necessary beyond the literal reading. This is too easy. It is no wonder, that we find Herodotus and his works generally misrepresented in this book. When there is talk about the spectrum of academic opinions about Herodotus, this book starts to talk about the radical skeptics who even do not believe that Herodotus was in Egypt at all, and then ... the depiction of the spectrum of opinions about Herodotus surprisingly ends unfinished without further ado (page 33). The reader gets to know only about these radical skeptics. As if they represented the mainstream opinion in academia, what they do not. The reader does not get to know that Herodotus put his sources under scrutiny. That Herodotus often added his opinion about how reliable a story is, or that he expresses the opinion that he feels obliged to write about something although he does not believe it. That Herodotus made different use of the words "mythos" and "logos" according to the reliablity of the story. The Greek word "historie" coined by Herodotus translates to "research", i.e. research for what had really happened, in order to preserve it for posterity. There are scholars who do not hesitate to see in Herodotus the first beginnings of history writing as a science. – But this book tells a completely other story (page 33): That Herodotus allegedly did not distinguish myth and history. That he allegedly did not act like a scientist. That Herodotus allegedly would come from a world where history is told in myths: Not true! Herodotus was part of the generation of the sophists, and he is clearly influenced by sophistic skepticism. Finally, this books' opinion that a special meaning of "historia" in Proclus' works in Late Antiquity (rather "story" than "history") applied to "ancient Greece" as a whole, and to Herodotus (page 117, 320), is clearly wrong. Concerning Herodotus' visit in Sais, the book presses for the question why Herodotus did not get to know anything about Atlantis there: "The historian reports a great deal of interesting information that he gleaned at Sais, but if the priest told him anything about Atlantis, he didn't include it in his work." (page 32). But it is clearly wrong that Herodotus "reports a great deal of interesting information that he gleaned at Sais" from the priest. Quite the opposite is true. Herodotus was told only one single myth by the priest, and afterwards Herodotus guessed whether the priest had ridiculed him. Why does this book pretend that Herodotus "reports a great deal of interesting information that he gleaned at Sais" from the priest? Besides this, there are many published good reasons why Herodotus – unlike Solon – did not get to know anything about Atlantis in Sais. But none of them is mentioned in this book. Concerning the important opinion of Aristotle, there is an interesting change of argument in this book, compared with the argument put forward in 2007 in the book about mythology by the same author. In 2007, it was simply claimed without further ado that in Strabo 2.3.6 there would be an explicit statement by Aristotle against the existence of Plato's Atlantis. Now in 2017, complicated considerations are offered to the readers on this topic. Why this? The reason is that in 2010 the book "Aristoteles und Atlantis" by Thorwald C. Franke had been published which disproved the claim that Aristotle spoke out against the existence of Atlantis. The English translation of Franke's book is listed in the bibliography, but the reader is not informed about it and its arguments. The complicated considerations now offered try to uphold the disproved claim. They are about similarities of words, and about Aristotle's statement about the non-existence of the so-called "wall of the Achaeans". But in the end, this book just only jumps (!) without further ado to the conclusion that Aristotle's authorship of the statement about the non-existence of the "wall of the Achaeans" somehow jumps over to the authorship of the statement about the non-existence of Atlantis (page 114). How, is not really explained. The impression cannot be avoided that the complicated considerations are written in the hope that the readers do not realize that there is a serious gap in this argument. And not one of the several counterarguments against Aristotle's authorship of this statement are mentioned. Concerning the similarities of words, this book follows the unfounded speculations of Harold A. Tarrant: The similarity of mere words such as "obliterate" and "invent" in various phrases in Greek literature allegedly gives a hint that Aristotle is the author of all of these phrases, including the phrase of "(not!) inventing" and "obliterating" Atlantis. But this is very questionable, since different people often use similar words when talking about similar things. And is there really a similarity between the phrase "invented" and the phrase "not invented" – or isn't this quite the opposite thing? Is there still a similarity when similar words are used in very different grammatical forms? And finally: Even if all these phrases indeed had been put into words by the same author, and even if this author was Aristotle (if...if...if...if), who says that Aristotle didn't insert a "not" concerning Atlantis, as did Plato? You cannot draw any conclusion from such unfounded speculations. What you can do instead, is looking for other hints about the opinion of Aristotle. And there you will quickly find many arguments which point to the conclusion that Aristotle was inclined to consider Atlantis rather a real place than an invention. The claim, that in Strabo 2.3.6 there is a statement by Aristotle against the existence of Plato's Atlantis, is dead, and the longer scholars need to accept this new situation, the more incredible they become. This erroneous claim came into being in the year 1816, by a mistake, as can be demonstrated. Before 1816 no one ever claimed that Aristotle spoke out against the existence of Plato's Atlantis. Quite the contrary: In the light of the other hints to Aristotle's opinion, Aristotle had always been considered an Atlantis supporter until the 19th century, when the erroneous view came into being. Concerning Crantor, this book presents the opinion of Harold A. Tarrant, that the word "historia" does not necessarily mean "history" in the context of Proclus' works, but rather "story" in a neutral sense. This is correct. Yet Crantor is still on the side of the Atlantis supporters since he tried to put forward evidence for its existence – you cannot strike him off the list of Atlantis supporters only because of a possible special meaning of "historia". By the way, Tarrant's opinion, that Plato was accused not of a lack of originality / of plagiarism, but of having fetched his political ideas from Egypt, is groundless and wrong for several reasons. The whole idea presented in this book, that Egypt was considered a place of negative and incredible information by the Greeks and especially by Plato, is wrong. Plato, as an intelligent person, had obviously a differentiated view. And how could Plato defend himself against plagiarism from Egypt with the Atlantis story which allegedly came ... from Egypt? Atlantis skeptics ensnare themselves in increasingly contradictory claims with this line of argument. Concerning Theophrastus, who was the direct successor of Aristotle as head of Aristotle's school, the book relies on Runia's opinion that Theophrastus' words about Atlantis as a real place are not written by Theophrastus but inserted by a later author. Yet this book does not tell its readers that Runia clearly says that he has no evidence for this, and that this is rather a feeling because Aristotle allegedly spoke out against the existence of Atlantis. But ... what if Aristotle did not, as we have seen? Thus, the claim that Theophrastus, the direct successor to Aristotle, did not talk about Atlantis as a real place, is groundless, and this book should have told this to its readers. Concerning the influential polymath Posidonius, who was a faithful follower of Aristotle's geographical views and who spoke out in favour of the existence of Plato's Atlantis, this book spends only one meagre paragraph and does everything to talk down his opinion. The sentence that Posidonius "reputedly endorsed the existence" of Atlantis is questionable (page 129). Why "reputedly"? According to Strabo, Posidonius did this indeed, and there is no reason to doubt this. We could go on talking about a lot more misrepresentations in this book, e.g. of the opinion of Cassius Longinus, yet enough of that. Let us now provide a list of ancient thinkers who wrote about Plato's Atlantis but are omitted in this book: Strabo (only mentioned in passing when talking about Posidonius), Athenaios of Naucratis, Galenus, Zoticus, Calcidius (mentioned but not discussed), and Martianus Capella. Some of these ancient authors were found and presented to the public for the first time by Thorwald C. Franke in 2016, i.e. one year before this book was published. In addition to these authors, there were many authors who did not mention Atlantis explicitly but who confirmed important parts of the Atlantis story, so that we can safely conclude that they were in favour of the existence of Atlantis. The Middle Ages are clearly misrepresented in this book, too. In one meagre paragraph (on page 157), this book still spreads the modern myth that in the Middle Ages no one discussed Plato's Atlantis. But what about Remigius of Auxerre, Honorius Augustodunensis, Hugo of St. Viktor, Bernard of Chartres, William of Conches, Vincent of Beauvais, Walther of Metz, Albertus Magnus, Pietro d'Abano, Thomas Bradwardine, or Pierre d'Ailly? Some of them were in favour of, some of them against the existence of Atlantis ... the modern myth of the Middle Ages as a silent time concerning Plato's Atlantis is clearly disproved. The disproval was published by Thorwald C. Franke in 2016, one year before this book has been published. It is very sad that this book does not develop an appropriate understanding of the so-called "Platonic Myths". Without this, you only can go wrong. This can be observed with most Atlantis skeptics and most Atlantis supporters. It is a necessity to discuss the difference of "mythos" and "myth", because this is not the same! It would have been crucial to understand that a "Platonic Myth" is not necessarily a myth. And what an "eikos mythos" is. Instead, this book intersperses here and there short statements about "Plato's myths" which are either misleading or clearly wrong. On page 4 it is said: "Plato often used and invented myths ...". But were these "myths" myths? And were these "myths" really invented? And if invented, according to which rules? Scholars have developed a considerably more complicated view on the topic than this sentence claims. But this book just translates "mythos" with "myth" and comes to wrong conclusions, as can be seen on page 33: "Plato also uses mythos ('myth') to get at the truth: understanding is more important than facts." This is not correct at least for certain types of "Platonic Myths". Repeatedly, the book refers to Republic 382d in order to provide appalling and wrong interpretations of this passage: Here, Plato developed the concept of approaching truth, if the truth itself is not exactly known. The best approach to truth is still a mythos but as long as it is the best approach we have to keep this mythos (and now it is important: this mythos is *not* necessarily a myth and especially *not* an falsified story!). This is the concept of modern science, of establishing hypotheses, testing these hypotheses, keeping them as long as we have nothing better, and replacing them repeatedly by more and more correct hypotheses. – But this book interprets it as the permission to create lies and fabricated myths of which the creator knows that they are lies and wrong, in order to transport a moral lesson with them (page 311 and footnote 37, page 328). This is the ultimate misunderstanding of Plato's intentions. In this connection, it has to be observed, that this book suffers from the mistake to differentiate the historical tradition about Atlantis from Egypt on the one hand side, and what Critias makes of it in his speech on the other hand side. Only in footnote 102 on page 371 f. there is finally talk about this difference just in order to ignore it as unimportant without further ado. Concerning the development of Atlantis hypotheses after the Middle Ages until today, this book tells the usual "black legend": That the Atlantis story had been used to justify conquest and nationalism, and finally it served "the Nazis" as a basis for their ideology. Of course, this "black legend" is completely wrong. Spanish conquistadores did not use Atlantis as a justification for their conquests. Here, this book just copies a mistake from Vidal-Naquet's book concerning Johannes Goropius Becanus. And John Dee did not use Atlantis as a justification for British claims in America. John Dee called America Atlantis, yet his claims were founded on a certain Madoc who allegedly discovered America before Columbus, and not at all on Atlantis. It would have been worth to mention Sigüenza who used the Atlantis story for the opposite purpose, i.e. in order to justify the claim that the American Indians are human beings as the Europeans. But such positive views are omitted. It is also very questionable to represent Carli or Rudbeck as driven by nationalism. Didn't their claim that all peoples came from Atlantis establish a common bond among the various peoples? Carli and Rudbeck were patriots indeed, but nationalists "avant la lettre"? No. This book breathes an unintelligent atmosphere, where every Atlantis skeptic is praised as a modern rationalist, whereas every Atlantis supporter is ridiculed and considered silly. By this simplistic approach the real essence and the achievements of former times and thinkers are not appreciated appropriately but are put to undeserved mockery. It would have been worth e.g., to mention that Ficino and Kircher started to develop an understanding of "Platonic Myths". The "Pre-Adamites" of La Peyrère are also no reason for mockery, but an important step towards abandoning the dogma of biblical chronology according to which the world is only 6000 years old. Or it would have been a necessity to discuss that Thomas Henri Martin, although believing that the Atlantis story is not true, still believed that the Atlantis story came from Egypt – which is an opinion clearly opposed to the perspective and concept of this book. Although Martin's opinion is cited in this book, it is passed over without spending a single word on it. Finally, "the Nazis". If one thing is sure, then that "the Nazis" did not believe in Atlantis. Heinrich Himmler did, yet "the Nazis" did not. Nevertheless, this book repeatedly speaks of "the Nazis", even in headlines, and writes "that Nazi ideology was happy to embrace the idea that the Atlanteans generated the Aryan race." Furthermore, this book sublimely suggests that the atrocities of National Socialism were somehow connected with the alleged belief in Atlantis, by statements such as: "Those who can make you believe absurdities can make you commit atrocities." or: "But the fact that German's history in the 1930s and 1940s is anything but wondrous owes a certain amount to the kind of manipulation of the truth that pseudoscientific Atlantis speculation perpetrates." (pages 261, 264, 268). – This depiction of an alleged Nazi-Atlantis connection is itself pseudo-history in the line of Indiana Jones movies. The book also suffers from a serious lack of cited literature, since Richard Wagner, Rosenberg and Goodrick-Clarke are missing entirely. – While this book presses for an alleged Nazi-Atlantis connection, connections between Atlantis belief and Socialism are completely omitted. This book concentrates a lot on the development of Atlantis location hypotheses but it does not focus on the development of Atlantis skepticism. This gives the reader the impression that there was no such development, as if "intelligent" persons "always" were Atlantis skeptics. But this is wrong. Atlantis skepticism prevailed in academia only beginning with the 19th century. This book does not talk about the Göttingen Empirists and Materialists, or Franz Susemihl, and in the chapter about Romanticism this book has completely "forgotten" that Atlantis skepticism evolved exactly in the period of the "Romantic" interpretation of Plato! For Romanticists, myths are everything, and rationality and facts are nothing, and they imputed this romantic attitude to Plato. The idea of Atlantis as a myth and an invention evolved from romantic ideas, under the perspective of a romantic interpretation of Platonic Myths. These wrong romantic ideas about Platonic Myths can still be identified ... in this book! See above. Furthermore, this book does not discuss the problems of the invention hypothesis. As if there were no such problems. What about the fact that the proponents of the invention hypothesis contradict each other in many aspects of their invention hypotheses? Some say e.g. that Plato used models from Herodotus for his alleged invention because he wanted to allude to the Persian Wars; others say that he used these models but he did not want them to be recognized as an allusion to anything; and others say that Plato did not use any models at all but invented everything out of thin air. Concerning the Noble Lie, which is explicitly the preferred interpretation in many passages in this book, there are serious differences between scholars. Some say that the Atlantis story is not a Noble Lie at all. Others say, it is a Noble Lie but only within the dialogues, not for their readers in the real world. Others say that the Noble Lie is intended to deceive the readers of the dialogues. And of course: If the readers of the dialogues could not recognize the story as wrong, doesn't this mean that it was believable in Plato's times? And if it was believable, doesn't this open up the possibility that Plato (and Solon, and the Egyptian priest) did not invent this story but made mistakes in interpreting ancient sources, such as the Greeks' general mistake with the 10000+ years of Egypt? How do you distinguish a well-made deception from a true story with mistakes in it? Wouldn't this question be worth to be discussed? The presented translation of Plato's dialogues Timaeus and Critias contains some mistakes, yet these are no special mistakes of this translation. They are common mistakes of many other known translations. It is a pity that the comments to the translation are put into footnotes. They contain many important arguments! So you have to read through lengthy footnotes given in small print at the end of the book, which is very annoying. We do not talk any more about the mistake to expect "Atlantis" to be the name of Atlantis (pages 304, 333), although this is nonsense since "Atlantis" is not a name as this book itself clearly says on page 3 and page 292 (against Erich von Däniken, by the way). Or about the mistake to assume 1000 years of oral tradition because of the difference of 8000 and 9000 years (footnote 66 on page 366). Or about the mistake to consider "oreichalkos" simply and only as a "mythical" substance (footnote 72 on page 378). Or about the mistake to interpret a "hos logos" as indication that the story is invented (footnote 131 on page 384). Or about the mistake to see in Theopompus' Meropis hints to an allegorical character of the Atlantis story (page 111). Or about the mistake to interpret Plinius' "si Platoni credimus" as doubt about the existence of Atlantis (page 136). Or about the mistake to realize that the Atlantis skepticism of Cosmas Indicopleustes indicates its opposite since Cosmas was a Christian fanatic against (!) the Classical Tradition (page 154). Or about the mistake to define the length of a stadion with 200 meters (footnote 8 on page 349). Many, many more things could be said, but we leave it at that. In the very last chapter, the conclusion is drawn that "looking for Atlantis resembles trying to find Hogwarts in J.K. Rowling's Harry Potter novels". This comparison reveals that this book suffers from a serious lack of understanding of the problems it is dealing with. J.K. Rowling's Harry Potter novels are not presented as true stories, but Plato's Atlantis is. (Otherwise this book could not talk of it as a Noble Lie.) And J.K. Rowling's Harry Potter novels contain many magical and phantastical elements, whereas Plato's Atlantis story does not, at least in the eyes of Plato and his contemporaries – and this is the perspective which we have to consider: The historical-critical perspective. Despite all understanding for the fight against all sorts of nonsense about Atlantis, it has to be criticized that this book exaggerates this fight and goes to the other extreme. This book is not fair to its readers. You cannot write a book like that any more – if you ever were allowed to write books like that. University scholars have to be very, very careful to avoid loosing their credibility. Because only credibility will provide them the authority to keep alive the ideal of academia, and to speak out against utter nonsense. This review is not intended to prevent you from buying this book. If you are really interested in Atlantis as a real place, then please consider that you are credible only, if you engaged yourself with the arguments of Atlantis skeptics. Therefore: Buy this book, read it carefully, including the footnotes, and make up your own mind on the matter. In 2018, Kershaw's book was reprinted by Pegasus Books for the US book market under a different title, without announcing that this is just the same book. Even on the copyright page this fact is not mentioned! The book itself is exactly the same, page by page, word by word, including bibliography and index. – Again, this book was not fair to its readers, who bought the same book twice under different titles. And it reminds of the repeated exercise of peudoscientific authors who edit their same books time and again under various titles. US: "Steve P. Kershaw, Ph.D."
UK: "A brief history of Atlantis – Plato's ideal state"
US: "The search for Atlantis – A history of Plato's ideal state"
UK: The emphasis is completely on contemporary politics and "Trumpism". First sentence of the blurb in style of a headline is: "Why today's leaders should pay heed to Plato's tales of an ideal state, and its ruin." Further: "contemporary relevance", and: "post-truth world", and: "should be prescribed reading for every political leader." US: The US blurb puts the emphasis on the aspect of the search, on open questions, and even omits completely that the basic idea of this book is that Atlantis is an invention and nothing more. In the jacket's inside blurb, one sentence of the British version is repeated: "... should be prescribed reading for every political leader." And then the question follows, whether Atlantis is history or a parable, and this question is left open, as if the book left this question open. 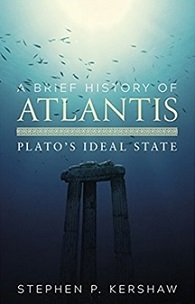 Kershaw (2017): Stephen P. Kershaw, A Brief History of Atlantis – Plato's Ideal State, Robinson, London 2017. 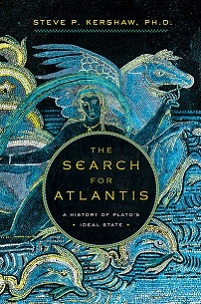 Kershaw (2018): Steve P. Kershaw, The search for Atlantis – A history of Plato's ideal state, Pegasus Books, New York 2018.